A lot of animal deaths are caused by Global Warming. For example, Polar Bears are dying because of us. They stand on a bit of ice, it splits from the main land and they float out to sea. They they stray too far from land and drown because they can't swim once the ice has broken. For example, Jaguars. They are dying because apparently we need more houses and crops. So we say, "Oh look, useless forest. Let's just cut it down and build a farm here, that would be much more useful." They don't even care the tiniest bit about the animals. Right now these are a favorite of mine and I did a whole bunch of research on them. They live in the freshwater rivers in the rainforests of Indonesia, Southern China, Southern India, the Philippines and South-east Asia. 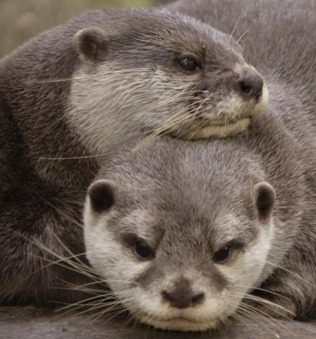 They are the smallest carnivorous otters. They weigh two to eleven pounds and they measure up to twenty-four inches long. Their tails are around nine to twelve inches. They are almost all brown except for a creamy white on their necks and faces. These otters use their paws to catch their food, and they eat crabs, crayfish, mussels, shellfish, and snails. They sometimes also eat fish, frogs, and aquatic birds. They look for their food by moving rocks and looking under things in the water. They live in family groups of up to fifteen otters. They raise around one or two litters a year with a help from their brothers and sisters. The baby otters do not open their eyes until they are forty days old. Which is around one and three quarter months. They begin swimming at nine weeks, and eat solid food at around eight days old. They live around ten to fifteen years. They are very playful and social, and they have around twelve calls. They are aggressive, though, when it comes to defending their territory. Asian Small-Clawed Otters are not considered endangered, but they are dying because of radpid habitat destruction, they are getting hunted, and also the pollution that is getting dumped in the rivers. They are NT (Near Threatened) on the Endangered List. Wolves also interest me a lot. Wolves are found in groups called packs. 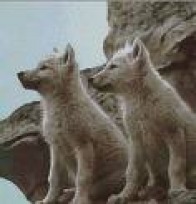 They compose of the parents, a male and female wolf, and their pups. Sometimes you may see other adult wolves but these are just the grown up pups. Wolves are part of the dog family which also includes coyotes, and foxes. The domestication began around one hundred thousand to fifty thousand years ago. Wolves are not actually that cruel, they only kill animals for food for them to survive. Wolves will eat around ten pounds of meat a day. They are around twenty six to thirty eight inches tall at the shoulder, and they weigh seventy to one hundred thirty pounds. They can measure from head to tail four and a half feet to six and a half feet. Females usually weigh twenty percent less then males. Grey Wolves are endangered. There are two thousand five hundred in the lower fifty-eight states, and there are ten thousand in Alaska.